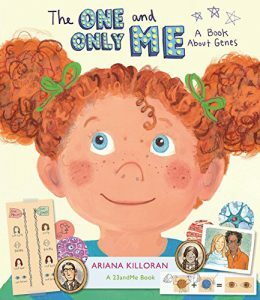 23andMe again turned to Ariana Killoran to complete its newest book, The One And Only Me, which communicates the complicated and important science of genetics in a way that kids can understand. This is the second children’s book on genetics by Ariana, an illustrator who has worked with the company since its beginning. Her first book for the company, You Share Genes with Me, came out in 2013. Probably best known for her innovative and whimsical Genetics 101 educational videos, Ariana sat down with us recently to discuss her work and the latest book. This is your second kids book on genetics. Why do an illustrated children’s book on this? For two reasons, really: First, the world of medicine is being transformed by new genetic discoveries and increasing access to personal genetic information, yet there are very few children’s books out there that introduce genetics concepts to young children. I am a huge fan of the nonfiction picture book as a way of engaging kids in science. Illustration, when paired with clear, concise text, is such a powerful tool for communicating complex information to any audience. And while these days you can learn just about anything online (I made a whole series of Genetics 101 videos for 23andMe a number of years ago), books are still those treasured objects that kids can linger over, immerse themselves in, and discover over and over again. The other reason is more personal. My older daughter looks nothing like me (seriously, NOTHING like me), and exactly like her father. Ever since she was a baby, people have been unable to resist pointing out this fact to her. So she started asking me questions: Would she look just like Daddy when she grew up? Was she also related to Mommy? Could she be like Mommy in some other ways that she can’t see? Kids have their own questions about genetics and what it means for who they are and who they are going to be. What was your goal for this book? Illustrator Ariana Killoran and some of her traits. To give kids the tools to answer some of their questions about genetics, and to inspire them to ask more questions and seek out more answers. Science, and genetic science in particular, are pretty complicated, and yet you are able to communicate these concepts to kids. What’s your secret? I start by respecting kids as the powerful intellects that they are. To young kids, all new information is equal. There isn’t “hard” information and “easy” information. There is just new information and familiar information, information that sparks their interests, and information that doesn’t. Children are naturally curious about the world around them. It is only in high school and thereafter that we self-select into “science” and “nonscience” people. It’s then that some of us decide that we are incapable of learning whole subject areas of information. Kids don’t have those hang-ups. There are a zillion stories we could tell about genetics, but we have to pick just one to tell at a time, or else it becomes cluttered and noisy and impedes learning. I drive the scientists I work with crazy by cutting out all this stuff that they want to put into my book texts and video scripts. All things can’t be equally important to every story, and I want to do the hard work of finding what is important so the reader doesn’t have to. A lot of times when writing about science for kids, adults think the key is to use folksy or cutesy names or metaphors, and sugarcoat the information to make it more palatable. But I find if you really trim down the text so that you say only what you need to say, and then create beautiful illustrations that clearly communicate the same point in a slightly different angle, you create the best conditions for learning. Humor doesn’t hurt, either, because learning is supposed to be fun. If we give a kid a book that looks like that beloved bedtime story they curl up with every night, we are saying that within it there is something special. What interests you the most about genetics? 23andMe’s Education Program Ariana’s book is part of 23andMe’s broader mission to improve genetic literacy at all levels. Both books are part of 23andMe’s broader commitment to genetics education that started with its founding and, over the last decade, has included an educational video series with Khan Academy, crowdsourced curriculum for high school and college level science classes, webinars, speaking events, outreach activities, student contests, and even contributions to a traveling museum exhibit developed by the Smithsonian and National Institutes of Health. More recently, the company established an Education Grant Program to inspire educators to create an interactive learning experience for students by integrating personal genetics into their curriculum. The limits of genetics are most interesting to me. I want to know more about the way our experiences and the world around us interact with our genetics to make us who we are. As a parent of young kids, I love watching this phenomenon in action: these little people —— with some familiar looking eyes and ears and a whole bunch of other genetic bits and pieces they inherited from my husband and I —— develop into complex humans as they interact with the world around them. Looking at your illustrations there’s a certain lightness and humor there. How would you describe your style? Quirky, playful, at times irreverent. But I care about every character that I draw, and try to breathe some complexity into them. I am respectful of them, and I want to give viewers opportunities to connect with them. What are the picture books that were your favorites as a kid? The Babar books, Beatrix Potter books, Bread and Jam for Francis by Russell Hoban/Lillian Hoban, Harlequin and the Gift of Many Colors by Remy Charlip/Burton Supree, and People by Peter Spier. You studied African history at Yale and Berkeley, how did you wind up becoming an illustrator? Ha! A valid question. Classic Gemini? My husband used to call me “curveball” because of a particularly nutty email exchange we had while I was doing pre-dissertation research in Malawi. One day I sent him a message about how all the pieces of my project were falling into place, how I had made all these important contacts, how my language skills had progressed, and so forth. Less than 24 hours later, I sent him a message telling him I had decided to turn down my grant, leave grad school, and enroll full-time in art school to become an illustrator. I remember being really irritated when he thought I might be acting impulsively. But I have never looked back. The truth is, I have wanted to be a book illustrator my entire life. I have never lost my love of children’s books and children’s book art. I have always drawn, made, sculpted, built, collaged, what have you, but somehow didn’t realize it was a job I could have. Turns out being an illustrator is not only great because I get to draw all the time, but also because it requires that I constantly immerse myself in new subject areas. And, unlike the academic writing I was doing before, my illustrations let me communicate with all kinds of people, and lots of them. You were with 23andMe at the beginning and have been involved with the company off and on through that whole time. What do you see as the biggest changes in people’s perception of genetics in that time? What do you think 23andMe’s role has been in all that? When we started out ten years ago, the idea of personal genomics was a complete unknown for most people, myself included! The company had a ton of work to do just making people comfortable with the notion that individuals could access their genetic information and use it responsibly. There were a handful of companies on the market at the time, some more reputable and scientifically sound than others, and 23andMe worked hard to gain the trust of both consumers and the scientific community. Ten years later, many people have accepted that genetic data provides the next frontier in personalized medicine, and 23andMe is a trusted part of this change. From the very beginning, 23andMe has taken education very seriously and understood that the company has a responsibility to their customers to make sure they understand what their data is telling them. I think it is that commitment to education and transparency that has helped transform the industry into what it is today.